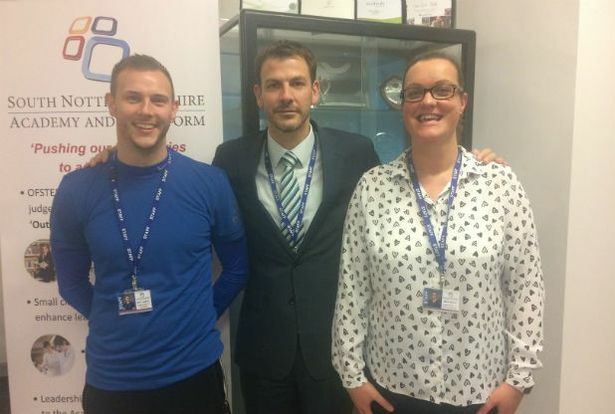 Life-saving team at South Nottinghamshire Academy - Scott Lowman, PE teacher, Dan Philpotts, head teacher, and Sam Proctor. A teenager whose life was saved by quick-thinking staff at a Nottinghamshire school has been called an “inspiration” after achieving top marks in his exams. Charlie Allison, 18, of Lingford, Cotgrave, suffered a sudden cardiac arrest at South Nottinghamshire Academy in December and would have died if staff had not raced to his aid. The sports-mad pupil, who played football for Bingham Town, said that if it wasn’t for the school then he may never have picked up his results today (August 17). It comes as students across the county have been picking up their A-level results today - with thousands securing their place at university. But now the excited teenager has secured a level three BTEC in sport, the equivalent of three As at A-level, and is about to start a new chapter of his life at Nottingham Trent University. He will be studying sports coaching and science. He told the Post: "I am just fortunate to be here still. I want to thank the school for saving my life and helping me get the grades that I needed, for pushing me to succeed. Without them I would not be here now. They have gone the extra mile." The keen Nottingham Forest supporter suddenly collapsed while exercising in the school's gym. He had suffered a sudden cardiac arrest – and every moment was critical as school staff fought to save his life. The Radcliffe-on-Trent school has a defibrillator on site – which delivers a charge to the heart – and had just received whole school training on how to use it a week before Charlie collapsed. PE teacher, Scott Lowman, and inclusion manager, Sam Proctor rushed to Charlie's aid and managed to bring the youngster back to life. He said: "I would have died without the help of the school. It was quite mad. It was just luck they had the training. It seems to be happening quite frequently to people my age." Charlie was rushed to City Hospital, where he says a number of tests were conducted, but no heart problems were detected. However, in April, it was decided that a major operation would be carried out where an implantable cardioverter defibrillator (ICD) was fitted next to his heart as "a precaution". The British Heart Foundation says that an ICD is inserted just under the collar bone and "looks similar to a pacemaker and is a little bigger than a matchbox". It constantly monitors heart rhythm and can deliver one or more shocks to try and restore the heart if problems are detected. Charlie has been a keen sportsman since he was six-years-old, making 144 appearances for Cotgrave Colts and playing for two years, mainly in right back, for Bingham Town. He was also in the Newark and Nottingham Cricket League for Keyworth Town and is a Nottingham Forest season ticket holder. The cardiac arrest has limited the amount of exercise the 18-year-old can do, and has halted his cricket and football, but it has not affected his ambitions to follow a career in sport. He said: "I have just always enjoyed sport and I could not see myself doing anything else. I still want to be a sports coach. I thought afterwards that I might not be able to do my BTEC. "I could not do the training that I did before, but the majority of it was theory and the teachers helped me catch up while I was in hospital. "I want to thank the school. I think that other schools should get these defibrillators fitted and be trained because you never know when it is going to happen to someone else." Dan Philpotts, head teacher at South Nottinghamshire Academy, said: "Charlie’s achievements are truly remarkable and he is a fantastic role model for everyone involved with South Nottinghamshire Academy and its community. "Not only has he achieved the highest possible grades but he has overcome such a significant barrier in the process – he is nothing short of an inspiration. "We know Charlie so well and we wish him all the very best at university. Having achieved what he has this year then nothing can stand in his way."